Goodman is developing a logistics centre of around 70,000 sq m at the Star Park in Halle (Saale) for the online furniture retailer home24. The completion of the logistics property is scheduled for early 2019. Star Park in Halle was the chosen location because it offers excellent transport infrastructure with direct links to the A14 motorway. The new warehouse will have a logistics area of 70,000 sq m including 1,790 sq m of office space and a 1,095 sq m mezzanine area. 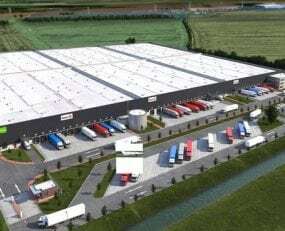 The property group has already developed logistics facilities for the online retailer in Ludwigsfeld near Berlin and in Walsrode (Lower Saxony). Halle’s solid growth as a logistics hub is largely due to its outstanding global transport links. Key routes for multimodal international goods transport run through the region, allowing home24 to quickly service its core markets of Germany, France, the Netherlands, Austria, Switzerland, and Italy. There are several motorways in the immediate vicinity. In addition, there is an excellent connection with the rail network and Leipzig/Halle Airport, Germany’s second-largest cargo airport, is just 15 minutes away. “Given the current strong demand in the area and the amount of current development we expect all the space at Star Park will have been taken by the end of 2019. That’s why we are already looking into developing new space,” said Mayor Bernd Wiegand. “With further new companies settling here, it is obvious that Star Park’s central location in the metropolitan region, with direct links to motorways, the airport and a rail marshalling yard, is also proving attractive to international investors,” added Dieter Götte, Managing Director of EVG Halle-Saalkreis mbH. “Halle is an attractive location for us, due to its ideal location and good transport connections. We have already carried out several projects with Goodman, and look forward to continuing our cooperation,” said a company spokesman for home24. home24 is an online retailer of home accessories. In Europe, the company delivers its products – regardless of size and weight – free of charge to the homes of its customers and also offers free returns.